The difference between a mortgage broker and bank is that a mortgage broker is not directly lending any money for a mortgage and is simply originating and brokering a loan. In other words, a mortgage broker is a middleman that does not have any skin in the game. This is in contrast to a mortgage banker who will typically be representing a traditional bank lender like a JPMorgan Chase or Capital One. A bank lender will typically put up its own capital to fund a mortgage, unlike a mortgage broker who is simply shopping a loan among the community of mortgage lenders. Mortgage brokers are typically paid either by the borrower through a premium, or by the bank lender. Mortgage brokers can be paid over 2% of the loan balances they originate, though these days the payout has decreased to around 1% or less due to higher competition from direct lenders. It is especially tough for mortgage brokers to do business in a market like New York City where big banks have such a strong presence. It is too easy for most consumers to ask their personal banker about buying a home in NYC, at which point they will be directly referred to the bank’s mortgage lending division. What Is a Correspondent Bank Lender? How Do You Become a Mortgage Banker? 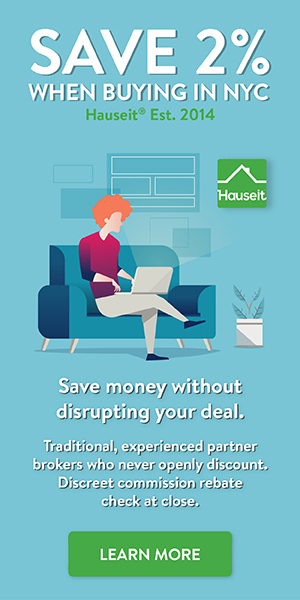 Hauseit offers NYC home buyers no strings attached introductions to brand name real estate brokerages in New York City who have agreed to discreetly provide a rebate of portion of their commission. Get $20,000 or more off your purchase with a NYC Buyer’s Broker Commission Rebate today! Note: It is possible for other parties, including mortgage brokers and bankers in a real estate transaction, to make an interested party contribution to help further the deal. Even though a mortgage broker can appear to be an unnecessary middleman, there can be benefits to using a mortgage broker especially in suburban America where big banks do not have a strong physical presence. In that case, it may be easier for a consumer to enlist the help of a mortgage broker to shop around for the best option. This may be especially true for first time home buyers who have no idea which banks are competitive in their area. Combined with the possibility that there may simply not be enough bank branches to just walk into, it may be simpler to have a mortgage broker check with all of the banks for the best rate. 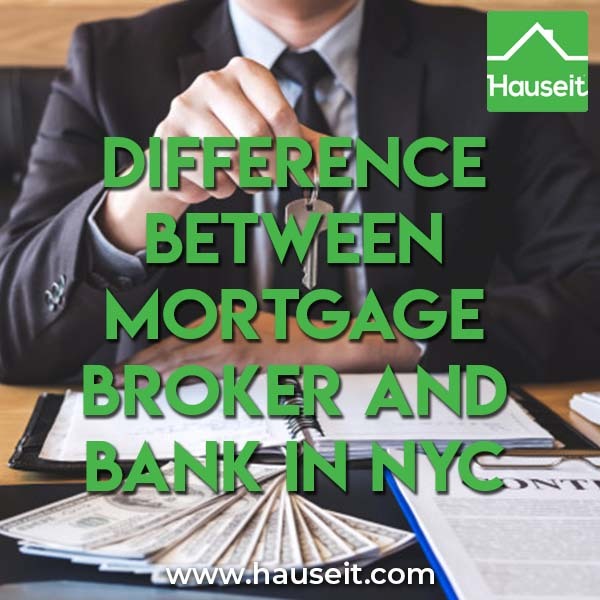 The difference between mortgage broker and bank is skewed in favor of direct bank lenders in densely populated urban centers like New York City. That’s because NYC consumers typically have their checking or savings accounts already held at a big bank like Bank of America or Citibank, all of which have a strong physical branch presence in NYC. Furthermore, most mortgage loan shoppers in New York City are sophisticated enough to know that they may be able to get a better rate directly with a mortgage lender. Most NYC home buyers and owners are also familiar with the names of big banks who will typically be more competitive on rates. For example, as of 2017 it is well known that Wells Fargo and Capital One are very aggressive on rates and terms. Furthermore, the fifty thousand licensed real estate agents in the city help promulgate information on which banks are currently the most competitive in terms of mortgage rates. An important difference between mortgage broker and bank is the fact that you are in closer contact with the source of the decision making when working directly with a bank lender. In contrast, you may not hear back for weeks on your commitment letter from a mortgage broker simply because he or she is waiting to hear back from a bank lender’s underwriting department. A mortgage banker on the other hand will typically have much easier access to their own bank’s underwriting department, and may have more influence over the course of events. A correspondent lender is a bank that only temporarily funds its mortgage originations through “warehouse lines of credit” from other banks. In other words, a correspondent lender attempts to de-risk its balance sheet by only temporarily drawing on a line of credit to originate and fund a mortgage, but will try to sell it quickly after closing. Once a correspondent bank sells the mortgage to another bank, or in some cases to Fannie or Freddie, the correspondent bank will use the proceeds to pay off the revolving line of credit. As a result, a correspondent bank takes principal risk to the mortgage for only a limited time period before the loan is sold from its books. This means that a correspondent bank does not engage in the servicing of the loan, which is where most traditional direct lenders make their money. Like a mortgage broker, a correspondent bank’s profit comes upfront. Once the line of credit is paid off, the correspondent bank is free to do it all over again and hopefully make a decent spread! Note: If the mortgage to your home is sold by your lender, you will receive a notice in the mail informing you of such. You should always verify this by calling your bank directly to avoid the risk of scams. A mortgage broker is an individual or company that solicits, processes, places or negotiates residential mortgage loans. Before they can start sourcing loans for purchasers or home owners, they must first be registered by the New York State Department of Financial Services. If an individual concurrently is licensed as a NYS Licensed Real Estate Broker, he or she must also submit a dual agency affidavit to the NYS Department of Financial Services. This is obviously different from the dual agency that occurs when a real estate broker represents both the buyer and seller in a transaction. Under Article 12-D of the New York Banking Law and Section 443 of New York’s Real Property Law, a mortgage broker who is also a real estate broker in the same residential real estate transaction must disclose dual agency to all parties. The buyer and seller both must sign a mortgage broker disclosure form and acknowledgement of dual agency before a mortgage broker can provide services. Note: Those employed by licensed mortgage brokers or mortgage bankers do not need a license of their own; however, a mortgage loan originator license is required if you will be involved in loan originations. To get a mortgage loan originator’s license one must fulfill certain educational requirements and also pass a written exam. Interesting fact: Mortgage loan servicers also need to be registered. A mortgage loan servicer does the back end work once a mortgage has been originated, including scheduling and receiving loan payments from the borrower. To register, a mortgage loan servicer must pay a fee and demonstrate a minimum $250,000 net worth and must be bonded for at least $300,000. A mortgage banker is an individual or company licensed by the New York State Department of Financial Services to engage in the business of making residential mortgage loans. A mortgage banker is also often known as a mortgage company, and is engaged in the business of making mortgage loans for new housing construction or for the purchase or refinancing of existing housing. 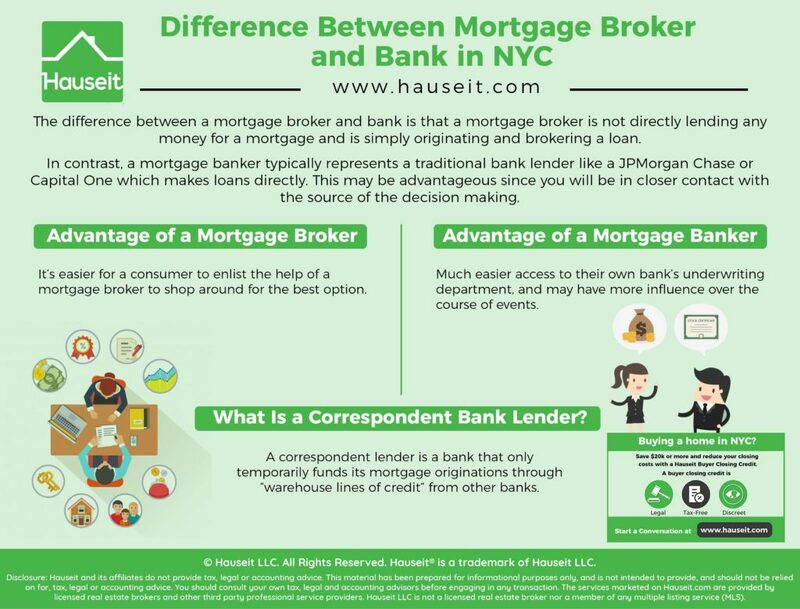 As you can see, the requirements are significantly tougher to become a mortgage banker versus a mortgage broker. A mortgage banker may be responsible for collecting mortgage payments and may risk their own capital. An additional benefit for mortgage bankers is that they are not required to report the yield service premium, also known as a yield spread premium.